Address ： Imagin Medical Inc.
Imagin Medical is developing imaging solutions for the early detection of cancer through the use of endoscopes. The Company believes it will radically improve the way physicians detect cancer. 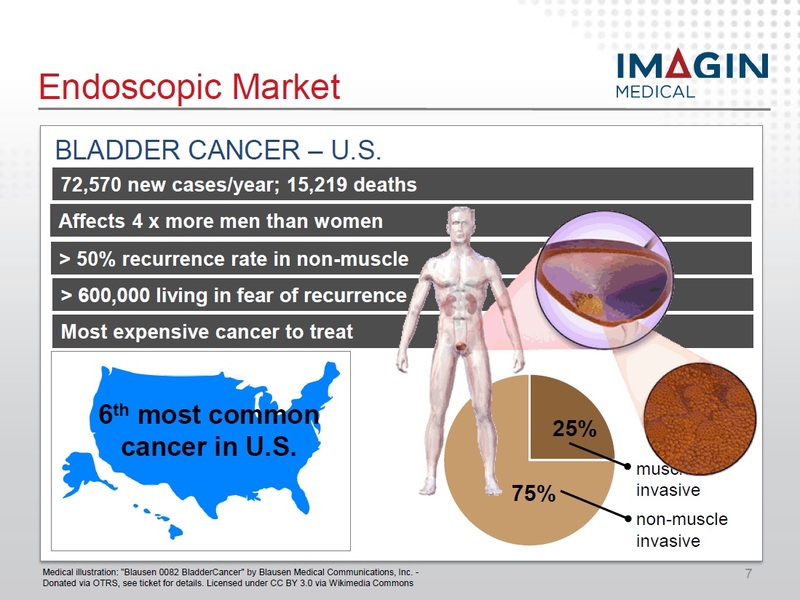 Imagin’s initial target market is bladder cancer, a major cancer worldwide, the sixth most prevalent in the U.S., and the most costly cancer to treat due to a greater than 50% recurrence rate. Developed at the Lawrence Livermore National Laboratory, this advanced, ultrasensitive imaging technology is based upon improved optical designs, patented computer technology and advanced light sensors. 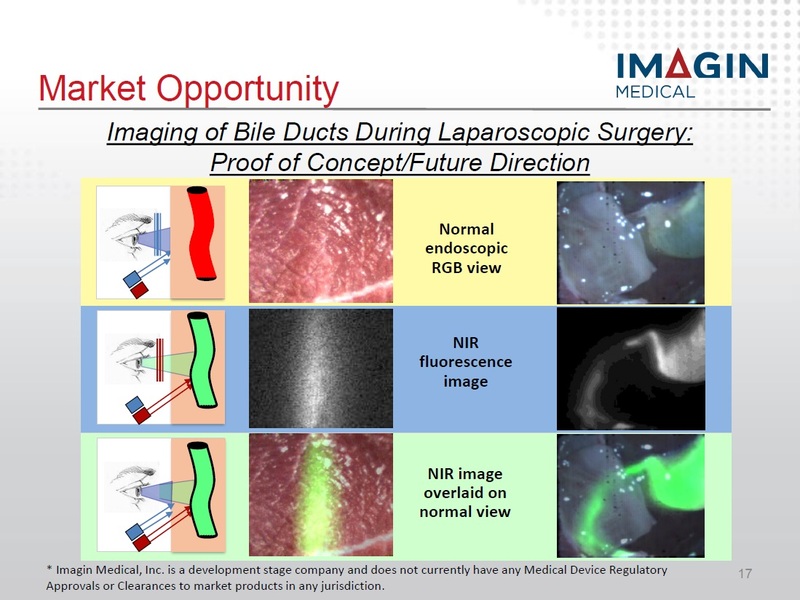 Imagin Medical is developing the i/BlueTM Imaging System to help detect bladder cancer and reduce its recurrence by dramatically improving the urologist’s ability to visualize, identify and remove cancerous cells. The Company’s advanced combination of optical/light sensor technology, patented computer technology, white light and near-infrared fluorescence delivers superior images in less than 15 minutes vs. the one hour required by conventional systems. The time savings is expected to increase the efficiency of the Operating Room and reduce healthcare costs by potentially enabling the procedure to be performed in the less expensive physician’s office for follow-up exams. The Company’s products are based on the technology invented by Dr. Stavros Demos at the Lawrence Livermore National Laboratory (LLNL). Dr. Demos worked in collaboration with the UC Davis Comprehensive Cancer Center and Dr. Ralph deVere White, one of the world’s leading authorities on bladder cancer, for more than five years to determine feasibility. Imagin has since licensed the technology from LLNL and moved the final stages of development to the University of Rochester Laboratory for Laser Energetics (LLE). 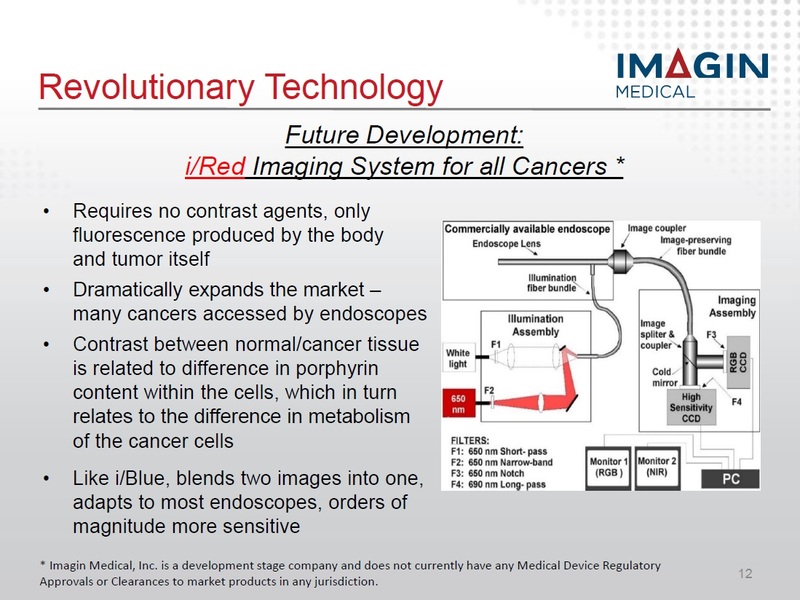 As Imagin Medical establishes the i/Blue Imaging System in the urology market, the Company will be completing the development of the i/Red Imaging System. This technology requires no imaging agents. Limited R&D risks. This is an execution play. Strong acquisition market. Most medical device companies grow by acquisition, not organically. Imagin Medical believes that the Company will have significant value and multiple liquidity options. 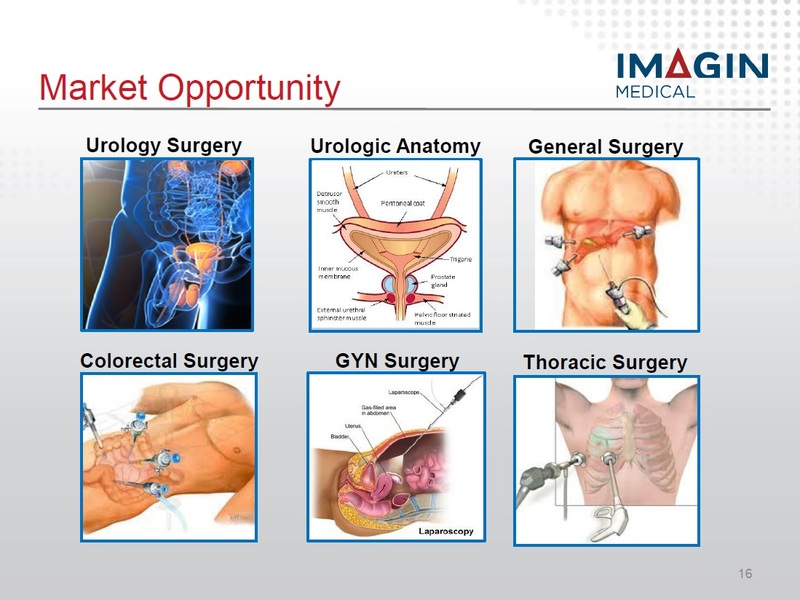 * Imagin Medical, Inc. is a development stage company and does not currently have any Medical Device Regulatory Approvals or Clearances to market products in any jurisdiction. Mr. Hutchens is a proven entrepreneur with over 30 years of experience in general and marketing management in the medical technology industry. Mr. Hutchens also served as a Managing Partner in Origin Partners, founder and CEO of Microsurge Inc. and Choice Therapeutics, Vice President, Marketing and Sales of Microvasive Endoscopy. Mr. Avelino has over 30 years of accounting and financial management experience in both the private and public sectors. Since 1986 Mr. Avelino has dealt with start-up ventures and public companies involved in the resource and high-tech industries. Mr. Vergano has been president of The Harvest Group Inc. since 1998. His medical device experience includes the gynecology, laparoscopic surgery, GI endoscopy, dental imaging and implants, wound care, cardiology, urinary incontinence and orthobiologic regenerative technologies markets. He is the holder of 11 medical device patents. Mr. Ruggles has over 30 years of experience in domestic and international regulatory affairs, operations management, manufacturing quality assurance, R&D, and supply chain management for early stage companies and large multinationals. Mr. McMahon has been involved in medical device sales and marketing for over 35 years. He is currently the owner and president of Urolaze, an independent urology focused distribution company. On March 3, 2017, Imagin Medical Inc. announced that it has closed the private placement announced on Feb. 24, 2017, through the issuance of $118,000 aggregate principal amount unsecured convertible notes at a price of $1,000 of principal amount per note. On March 2, 2017, Imagin Medical Inc. announced that Imagin Medical Inc. and Optel Inc., its product design partner, have achieved the first steps of their plan for the manufacture and commercialization of the i/Blue imaging system. On February 24, 2017, Imagin Medical Inc. announced that it will issue on a private placement basis $100,000 aggregate principal amount unsecured convertible notes at a price of $1,000 of principal amount per note. On February 22, 2017, Imagin Medical Inc. announced that it has executed a non-binding term sheet with an institutional investor wishing to invest up to $8-million into the company. The understanding provides for a series of private placement offerings to be conducted between the company and Alumina Partners (Ontario) Ltd., a subsidiary of New York's Alumina Partners LLC, over the course of 24 months. On December 9, 2019, Further to its press releases of Sept. 13, 2016, Oct. 20, 2016, and Nov. 1, 2016, Imagin Medical Inc. announced that it has closed the final tranche of its private placement, through the issuance of an additional 3,873,605 units at a price of eight cents per unit for gross proceeds of $309,888.40. On December 8, 2019, Imagin Medical Inc. announced that it is partnering with Optel Inc., an optical product design firm located in Rochester, N.Y., to design the i/Blue imaging system for manufacturability and commercialization. On December 1, 2016, Imagin Medical Inc. announced that it has completed development of its i/Blue Alpha B prototype. Clinical trials are scheduled for early 2017. In addition, Imagin is in current negotiations with a product design firm to move i/Blue imaging system through manufacturing and commercialization. On November 10, 2016, Imagin Medical Inc. announced that Dr. Roger Buckley has joined Imagin's scientific board of advisers. Dr. Buckley is the division head of urology at North York General Hospital in Toronto, and is considered a top urologist in Canada. On November 1, 2016, Imagin Medical Inc. announced that it intends to continue its non-brokered private placement announced Sept. 14, 2016, to raise $800,000 through the distribution of units at eight cents per unit. Proceeds from the placement will be used for general working capital purposes. On October 27, 2016, Imagin Medical Inc. announced that Dr. Liam J. Hurley, a member of the Northeast Urologic Surgery PC, has joined Imagin Medical Inc.'s scientific board of advisers. Dr. Hurley is board certified in urology and is a fellow of the American College of Surgeons. In 2006, he was chosen as one of Boston's top doctors by Boston Magazine. On October 20, 2016, further to its Sept. 13, 2016, press release, Imagin Medical Inc. has closed tranche I of a non-brokered private placement through the issuance of 4,822,500 units at a price of eight cents per unit for gross proceeds of $385,800. The Company intends to close the remainder of this financing within the next two weeks. On October 6, 2016, Imagin Medical Inc. announced that its quality plan for compliance with U.S. Food and Drug Administration regulations and International Standard ISO 13485 has been approved by the Company's management team. The quality management system (QMS) will detail the generation and management of all the company's standard operating procedures, design history file documents, and all quality records to support the development of the i/Blue imaging system for the detection of bladder cancer. Design control procedures have been developed and implemented to support and document the prototype development under way at the University of Rochester's laboratory for laser energetics. On September 29, 2016, Imagin Medical Inc. announced that Ken Daignault has joined Imagin Medical's board of directors. Mr. Daignault has almost 30 years experience in the medical device field, with an emphasis in urology. He has held senior-level management positions in major medical device companies, most recently with Boston Scientific as director of research and development, urology. Mr. Daignault has strong relationships within the urology field and with key medical institutions, as well as a record of bringing products from concept through successful product launch. On September 22, 2016, Imagin Medical Inc. announced that Dr. Edward Messing, chair of urology, University of Rochester Medical Center, has joined Imagin's scientific board of advisers. Dr. Messing is a renowned expert in the diagnosis and treatment of cancers of the bladder, prostate, kidney and other genitourinary organs. 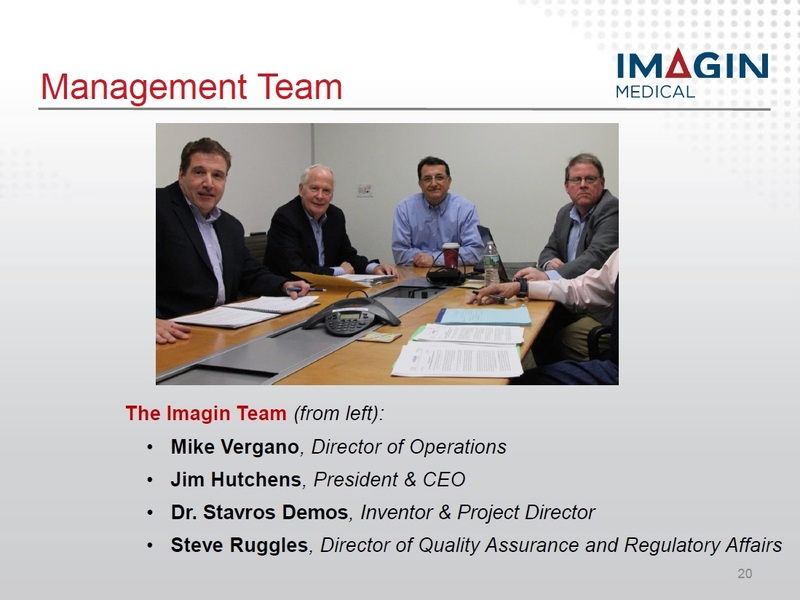 On September 15, 2016, as a follow-up to Imagin Medical Inc.'s announcement of an $800,000 private placement on Sept. 13, 2016, the Company notes that it is making significant progress not only in the capital raise, but also in developing its disruptive technology, the i/Blue imaging system. The Company's immediate goal is to complete the retrofitting of the alpha prototype by year-end. Bench testing and clinical studies will begin in the first quarter of 2017. On September 13, 2016, Imagin Medical Inc. announced that it intends to undertake a non-brokered private placement to raise $800,000 through the distribution of units at eight cents per unit. Proceeds from the placement will be used for general working capital purposes. 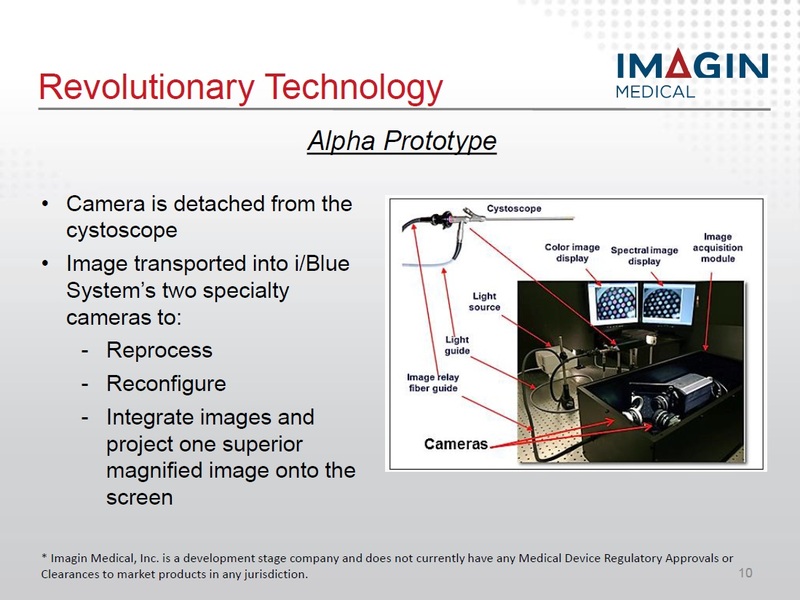 On August 2, 2016, Mr. James Hutchens, President and Chief Executive of Imagin Medical Inc., reported that the recent publication of the new American Urological Association's (AUA) guidelines for the diagnosis and treatment of bladder cancer strongly validates Imagin Medical Inc.'s objective of developing the i/Blue imaging system for the early detection of the disease. 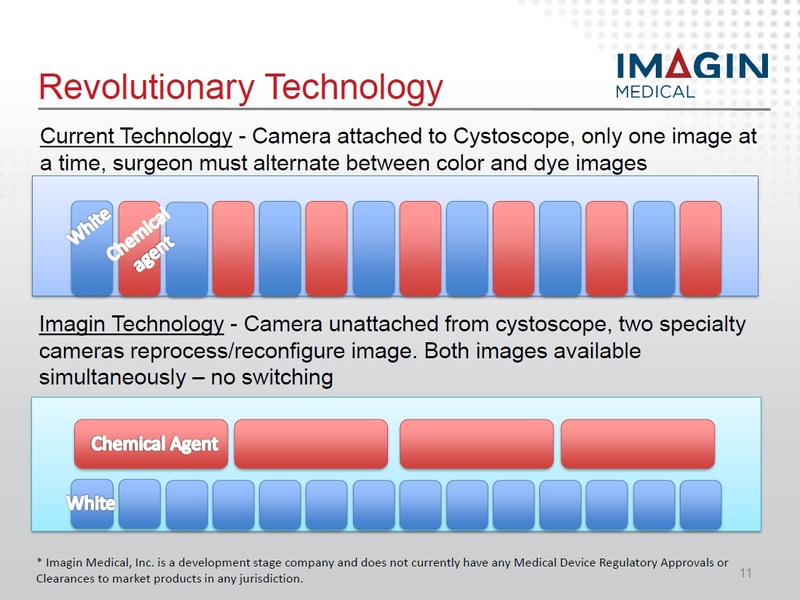 On July 20, 2016, Imagin Medical Inc. announced that its process of retrofitting and requalifying components to optimize the patented design of the i/Blue imaging system is on schedule.